Last weekend was our little guy’s first birthday. I ended up making him a mini cake along with cupcakes for our guests. I wanted another treat for them to snack but didn’t want anything that required a lot of work the day of. So a few days before the party I whipped up a batch of these cookies and tossed in some M&Ms. They were a hit! My husband said they reminded him of his favorite bakery’s chocolate chip cookies from his childhood. It doesn’t get much better than that! These cookies are adapted from the famous New York Times recipe that just happen to come from the one and only Jacques Torres- so you know they’re good! I didn’t want to buy any specialty ingredients (they call for bread flour and cake flour), so instead I used all-purpose flour and added cornstarch (aka homemade cake flour). I also thought that reducing granulated sugar to 1 cup instead of 1 cup +2 tablespoons and adding a bit more brown sugar was kind of a no-brainer. Who doesn’t love the flavor and texture that brown sugar gives to cookies? Lastly, I upped the vanilla just a bit (I’m a sucker for some Madagascar Burbon Vanilla Extract) and swapped out the chocolate discs for semisweet chips and chopped bittersweet chocolate. Two very good, very delicious ideas. The cookies were studded with chips and flecked with chunks of chocolate and delicate shavings. 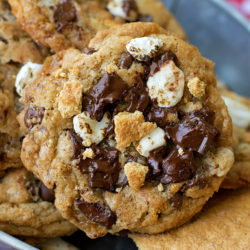 After I had the dough mixed up and my chocolate folded in, I placed the dough into an air-tight container and refrigerated it for 24 hours (for my chocolate chip M&M batch) and 72 hours for these cookies. The original recipe suggests at least 24 hours for optimal taste and texture, I think you could easily get away with 3. Just remember, the longer they chill, the more the flavor develops. When you’re ready to bake your cookies, scoop them, place them on lined baking sheets, sprinkle them with a pinch of sea salt (you’d be surprised by what a difference this makes) and toss them in the oven. Bake these little beauties until they’re golden brown on the edges and lightly golden brown in the centers (about 10-12 minutes). 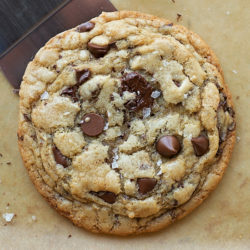 When you eat one of these cookies they should be crisp on the outside (especially the edges) and chewy and soft in the centers. The chocolate should ooze out with each bite. They are heavenly people- so incredibly worth the wait! 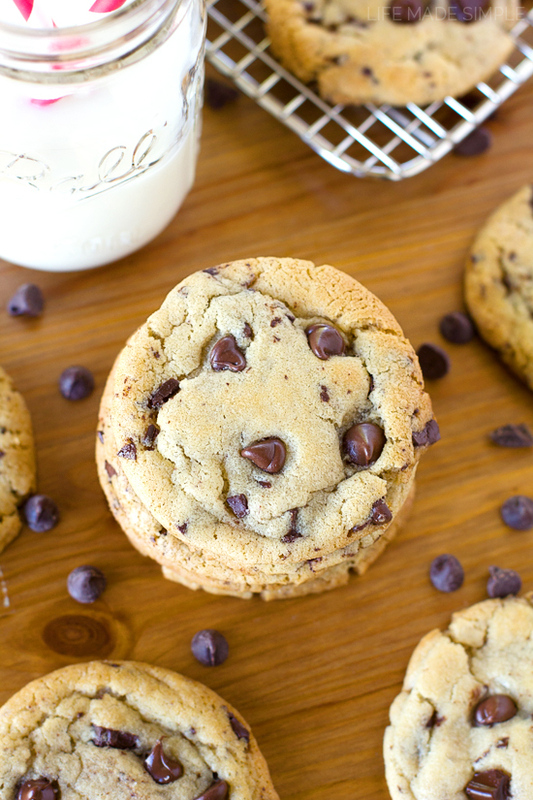 I hope you’ll give these bakery style chocolate chip cookies a try, they really are the best! 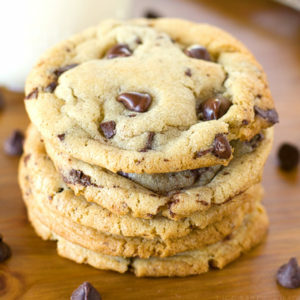 Crisp and chewy chocolate chip cookies studded with chocolate chips and flecked with chocolate chunks and shavings. These bakery style cookies are the best! In a large bowl, whisk together flour, cornstarch, baking powder, baking soda, and the 1.5 teaspoons sea salt, set aside. In a large mixing bowl of the bowl of a stand mixer, cream the butter, sugars until light and fluffy, about 3-4 minutes. Add the vanilla extract, then the eggs one at a time, mixing after each addition. With mixing speed on low, gradually add the dry ingredients, mix until just combined. Fold in the chocolate chips, chocolate chunks and any "shavings" you may have created while chopping the chocolate. Place the dough into an air-tight container and chill for 3 hours, preferably 24. The longer the dough chills, the better it tastes. I chilled mine for 72 hours. When ready to bake, preheat oven to 350 degrees. Line baking sheets with parchment paper or baking mats, set aside. 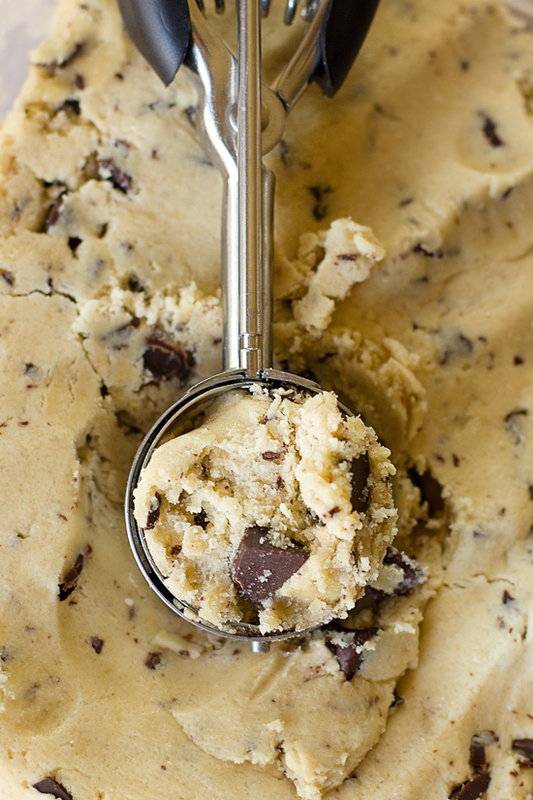 Using a standard size cookie scoop (1.5 tablespoons) place dough onto the prepared baking sheets (12 per sheet). Sprinkle the tops with a little sea salt, then place in the oven to bake for 10-12 minutes or until golden brown on the edges and lightly golden brown on the tops. The cookies should look a little soft in the centers but should not be doughy. Remove from the oven and allow to cool for 5 minutes on the sheets before transferring to a wire rack to cool completely. -These make great XL cookies, just use a large cookie scoop (3.5 tbsp), place 6 on a sheet and bake for approximately 18-20 minutes. Wow! 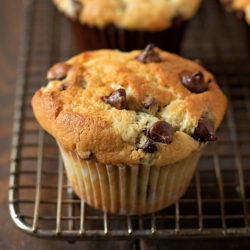 I just whipped up a batch of these and threw in the freezer for a little while to bake before my hubby gets home. The dough tasted AMAZING! Cannot wait to see how the finished product turns out. Thank you for sharing. Found it on Pinterest. Glad you liked them! Thanks for giving them a try Jamie! Does the dough freeze well? I wanted to roll the dough and store it in the freezer to pull out and bake just a few at a time. Do you think I would need to thaw them completely first, or could they go from freezer to oven? By the way I’m obsessed!!! I looked and looked for the cookie recipe that would be my “go to” and finally after 5 years I found this one. I make these cookies all the time. 75% of the time we have bags of frozen Dough in the freezer and they don’t always make it into the oven before they get snagged and eaten! Haha. Thanks so much! Hi! I absolutely love your website and I really want to try this recipe but l have a little problem. I leave in France and here we weigh the ingrédients. Hi Leila! I don’t have a scale so I just looked up the amounts online. Here’s what I found: 1 c. of granulated sugar = 200g, 1 c. of all-purpose flour = 125g and a stick of butter = 113g. Hope that helps. I know it’s not going to be exact, mainly because I’ve never measured it out in grams and baked them that way, but it should be pretty close! Just made these after letting the dough set for 36 hours…SO TASTY! and I might add, one of the prettiest chocolate chip cookies I’ve ever pulled out of the oven. Thank you for these! 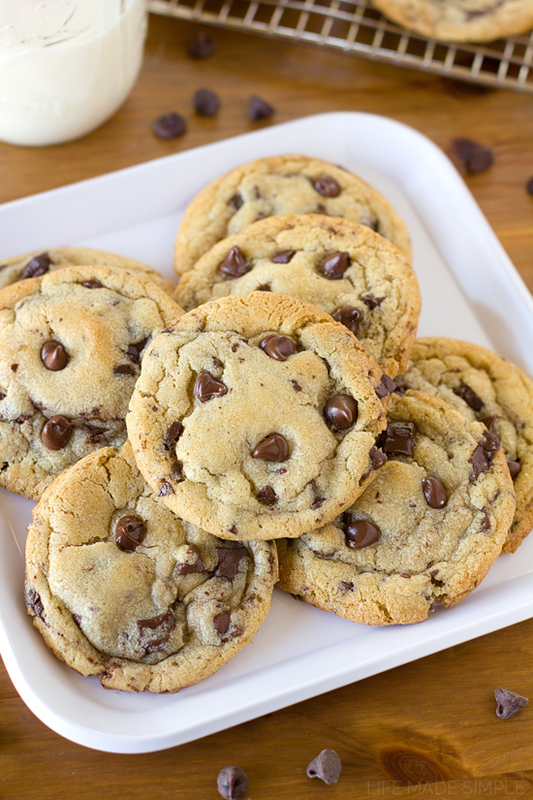 Your cookies look like the perfect chocolate chip cookies I’ve been looking for! Not too brown or greasy looking nor too flat or puffy. Just one question: how did you measure your flour? Did you spoon the flour into the measuring cup or did you scoop the flour with the cup? Thanks!! Hi Leila! I just baked these cookies after 40 hours in the fridge, and they came out flat, darker than yours and greasy looking 🙁 i followed the recipe to the letter, even measured the flour in grams following the New York Times Jacques Torres recipe. I even have an oven thermometer! I have tried soooo many recipes, but your cookies are the best looking ones! What do you think could have gone wrong? Is there a chance your oven gets hotter then 350? Do you use a non stick baking sheet, insulated or a regular one? I’m getting a little ocd here lol! Thank you!!! That’s really strange… I’ve never had that happen, and I make these a few times a month! I wonder what could have caused that to happen? followed the recipe exactly and refrigerated for 1 1/2 days, before baking….could taste the cornstarch after it was done, which (in my opinion) altered taste. 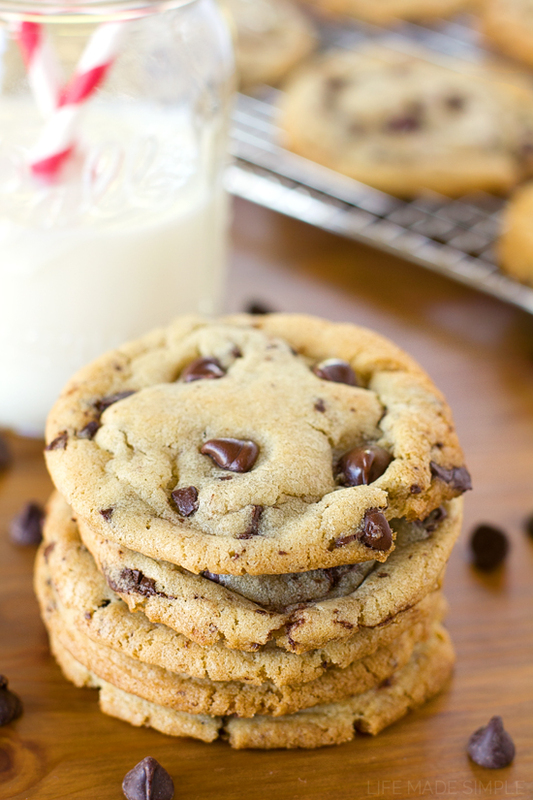 Should I bake chocolate chip cookies again using this recipe, I will omit the cornstarch. Has this been a noticeable taste in your batch? I also pulled it out before recommended bake time because they were turning browner than I wanted and did not spread out as I thought they would. HELP! I followed your recipe to a “T” and my cookies came out rock hard! I cooked them to perfection. They looked perfect then I bit into one and almost broke a tooth! I don’t have a stand mixer so I had to use my hand mixer. It was having a hard time mixing the dry ingredients and the dough felt dry before I even chilled it. Any suggestions? I made these today and they came out extremely salty and cake like. Not at all how I thought they’d be. I followed the recipe exactly except I didn’t sprinkle with salt at the end. I’m not sure what the issue was. I decided to try something new (I always made the Toll House “back-of-the-bag” cookies) and the whole family loved them! Oh, and here’s something my mom told me. After scooping the dough onto the baking sheets, press each one down a little with two fingers – not too much though. Love that trick, thanks for sharing! Hello, thank you for adding the flour measurement in grams, that’s so kind of you to do that for us! I was just wondering if you could please double check the flour measurement next time you make these? I think 3 1/2 cups might weigh more than 300g. The dough was way too soft. Thank you. I’ve got to make several hundred cookies for a grooms milk and cookies table. I’ve made a recipe using cornstarch many times and they’re so delicious. Seems though that they want to fall apart the next day or so. Do you have that problem? I want to use this recipe but am terrified of them falling apart the day of the wedding. Hi Melissa, you could always add a slice of white bread to the container you’re storing them in! Blushing over here! Thank you!! The grams are way off for the flour. 120 grams per cup. It should be 420 grams for 3 1/2 cups. And sugar is 192 grams per cup. I wanted to try a new chocolate chip cookie recipe for an outing and I am glad I chose this one. I made 3 batches and all were perfect – delicious taste. This recipe is highly recommended.